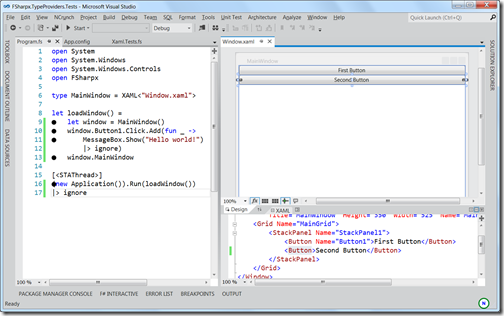 WPF Designer for F# » Rash thoughts about .NET, C#, F# and Dynamics NAV. F# 3.0 brings the new type providers feature which enables a lot of different applications. 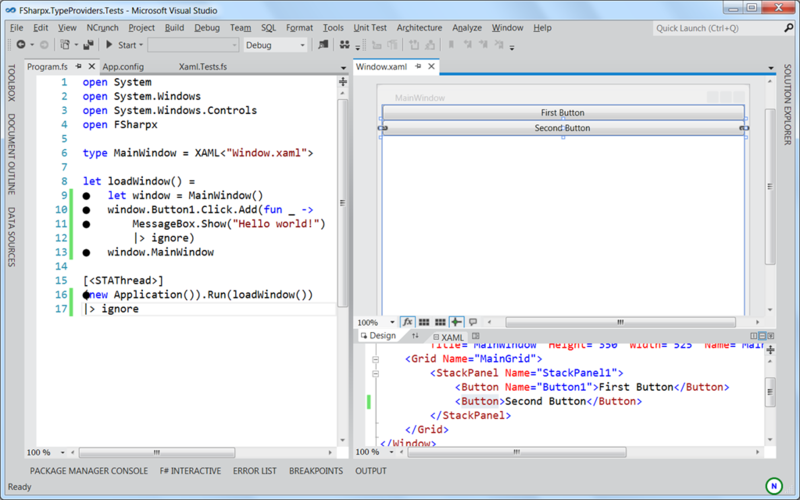 Today Iâ€™m happy to announce that the FSharpx project brings you a WPF designer for F# in the Visual Studio 11 beta. A big kudos to Johann Deneux for writing the underlying XAML type provider. BTW: No code generation needed is for this. No more nasty *.xaml.cs files. BTW2: Try to change the name of Button1 in the Xaml and press save. One thing I ran into with this is that Visual Studio sometimes doesn’t pick up when the XAML has changed — it doesn’t always rebuild when you change the XAML and re-run the project. I don’t think this is necessarily a type provider issue, more likely a F# project system issue, but if any of your readers come across it, the workaround is to clean the project before re-running. Is it possible to do code behind with this. For example if you have a custom user control which you want to add behaviour to via f# is it possible to use this technique so that when you add you’re custom control to the palette the code behind additions are also added? Merci beaucoup pour cette explication ! I really like this. Thanks Steffen. I used it for an F#J article “Create World … and other 3D”, substituting the C# xaml plumbing with this clean technique. My intro to it was the short blurb in Expert F# 3.0. Have you gotten other user experience feedback? XAML compiles, but Needs the added Name Attribute in the root element as noted on the download website. Thanks a lot..And how can i invoke my WPF Application from F#.. (i am having a project with Window.XAML and Window.XAML.cs .. need to invoke initialisecomponent() of Window.XAML.cs..